If you like flamenco even a little, you must see Soledad’s performance. Elsewhere, but this looks worth the detour and is an easy trip on the #2,3 express subway to Nevins St. (2 stops after Wall St.). Try the Pastrami, it’s just as good here as it is at the original on the Lower EastSide. My favorite NYCity film festival. These films are not all home runs, but it is so exciting when you find the next Pedro Almodóvar. ♦ NYCity, with a population of 8.6 million, had a record 65 million visitors last year and was TripAdvisor’s Traveler’s Choice Top U.S. Destination for 2018 – awesome! BUT quality shows draw crowds. Try to reserve seats for these top NYC events in advance, even if just earlier on the day of performance. Many consider NYCity the Jazz capital of the world. My favorite Jazz Clubs, all on Manhattan’s WestSide, feature top talent every night of the week. a classic, old jazz club in the Village, Caffe V often surprised with a wonderfully eclectic lineup. It was my favorite spot for an evening of listening enjoyment and discovery. Alas, Caffe V is no more, another victim of a rapacious NYC landlord. Owner Ishrat fought the good fight and Caffe V will be sorely missed. And more recently we have lost Cornelia Street Cafe. After 41 years, it too became another victim of an unreasonable rent increase. Corner Bistro / 331 W. 4th St. Sometimes you just need a beer and a burger. If so, Corner Bistro is the place you want. Located just outside the hip Meatpacking district, this corner bar and grill is decidedly unhip, but it’s not uncrowded, especially at night. Seems that everyone knows this place has one of the better burgers in town. In the maze of streets known as the West Village, where West 4th intersects with West 12th (and West 11th, and West 10th, go figure), you will eventually find Corner Bistro on the corner of West 4th and Jane Street. An unassuming neighborhood tavern, it looks just like dozens of other taverns around town. The bartender tells me that the Corner Bistro celebrated it’s 55th anniversary last year. The well worn interior tells me that the place itself is much older. Corner Bistro has outlasted many of those other taverns around town because they know how to keep it simple — just good burgers and beer, fairly priced. The classic bistro Burger is only $9.75, and should be ordered medium rare, which will be plenty rare for most folks. Actually, it will be a juicy, messy delight – make sure you have extra napkins. I like to pull up a stool and sit by the large front window in the afternoon, where I can rest my burger and beer on the shelf, and watch the Villagers walk by. Corner Bistro seems to attract very different groups of patrons depending on time of day. While it’s crowded with locals in the evening, in the afternoon you hear different foreign languages, and watch groups of euro tourists wander in, led by their guidebooks and smartphones. 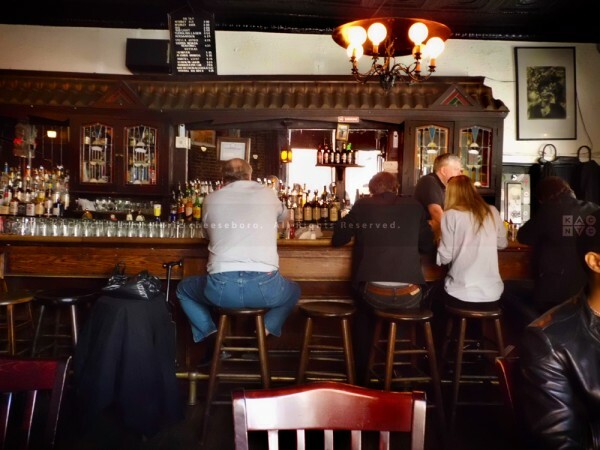 For the classic Bistro experience, order your burger with a McSorley’s draft, the dark preferably. This is the same beer that you can get over at the original McSorley’s in the East Village, the pub that claims to be the oldest continually operating bar in NYCity. The only difference is that this McSorley’s ale is served with a smile by the bartenders here. Or you can get a Sierra Nevada, Stella, or Hoegaarden on tap if you want to go upscale a bit. Either way this is a simple, but quality burger and beer experience that is just too rare these days (sorry for the pun). Walk: 1 blk W. on 13th St. to 8th Ave.; 1 blk S. on 8th Ave. to Jane St.
“Pub” is used in it’s broadest sense – bars, bar/restaurants, jazz clubs, wine bars, tapas bars, craft beer bars, dive bars, cocktail lounges, and of course, pubs – just about anyplace you can get a drink without a cover charge (except for certain jazz clubs). If you have a fave premier pub or good eating place on Manhattan’s WestSide let us all know about it – leave a comment. This entry was posted in Uncategorized and tagged AARON DIEHL TRIO, Affordable Art Fair, Bobby McFerrin & Gimme5, Duduka Da Fonseca Heli Alves and Maucha Adnet, Hamid Al-Saadi with Safaafir: The Maqam of Iraq, MANUEL VALERA AND THE NEW CUBAN EXPRESS BIG BAND, Samson et Dalila. Bookmark the permalink.